The tiny house movement seems to be taking over the nation, but living in modest quarters has pretty much always been the norm for the average New Yorker. 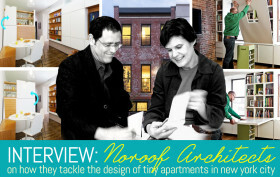 One architecture studio that’s focused their energies on the challenges of designing the super small—versus the super tall—is Fort Greene-based noroof Architects. Led by the duo of Margarita McGrath and Scott Oliver, the studio has been developing ingenious ideas that address the space challenges that come with living in a dense city—and they often involve transforming furniture. Jump ahead to learn more about how the pair approach downsized living and designing for families, where they find inspiration, and then get some ideas on how you can make your cramped apartment feel far more capacious.